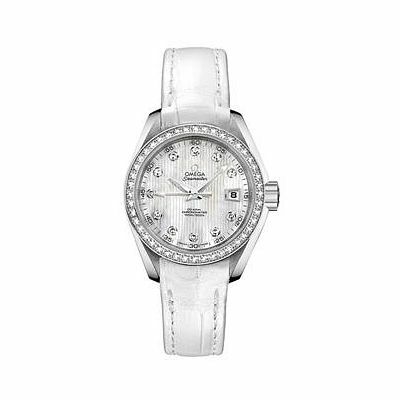 A simply sophisticated ladies' white leather strap watch from the alluring Seamaster Aqua Terra collection by Swiss watchmaker Omega. Crafted with a sleek stainless steel case, shimmering mother of pearl dial with dazzling diamond markers, co-axial chronometer and date window. A glittering diamond set bezel adds an extra feeling of indulgence and glamour.